The intimacy of a small, specialized college with all the benefits of a large university is what ESF students enjoy thanks to a longstanding partnership with neighboring Syracuse University. ESF students have many of the same opportunities and privileges as SU students, through this unique partnership, which encompasses just about everything related to college life and dates back to the founding of the College in 1911. ESF students can avail themselves of a variety of academic options at SU to supplement their ESF education. Special access to courses at SU enables our students to take classes in areas of interest not offered at ESF. Our students may also use SU’s extensive libraries and computer labs to supplement those on the ESF campus. They can enjoy meals in any of SU's five residential dining halls, food courts, snack bars and Cafés. 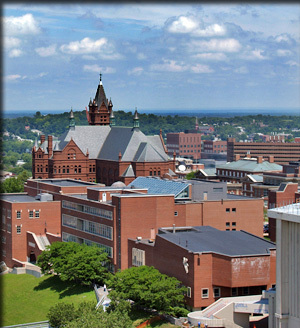 ESF students also utilize services of the Syracuse University Office of Disability Services. Outside the academic realm, the ESF/SU relationship provides students with the complete gamut of activities and sports. Students can join any of the 350+ extracurricular SU clubs or activities from the marching band that performs during football games, to the Sour Sitrus Society that serves as the pep band for the basketball team, to drama and musical groups, to sports clubs such as hockey or soccer. ESF students can’t participate in SU’s Division I NCAA sports but that doesn’t mean our students don’t get in on the action as spectators. On The Hill, the seasons are divided in three  football, basketball and lacrosse  giving our student body plenty of opportunity to cheer the Orange on to victory in the Carrier Dome (located right across the street from ESF’s Illick Hall). At the end of four years, ESF students are invited to attend SU's commencement ceremonies in the Dome, and ESF graduates receive a diploma that proudly carries the Syracuse University seal alongside the seal of the State University of New York College of Environmental Science and Forestry.